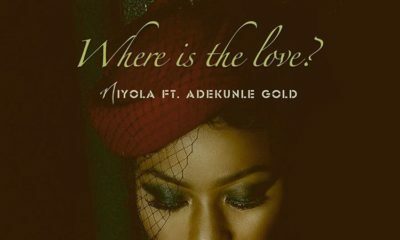 A concerned fan reached out to EME music star Niyola after she shared a bare-faced photo on Instagram. The fan appealed to Niyola to “change her Insta game” because she is a star and she has to always look “fly” otherwise her Instagram likes will be low. The fan explained to Niyola that even though Niyola obviously loves her natural look, she should know that she is in the music business. See the fan’s comment below. Niyola replied graciously, thanking the fan for looking out for her and she also explained why she is comfortable in her skin. 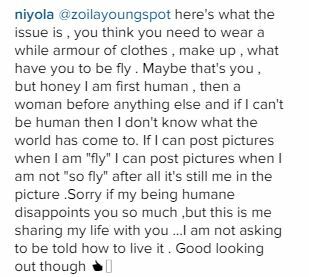 We like how Niyola took time out to reply graciously. What she is trying to tell us is that she is not concerned about her brand. That’s where the difference with her and actual stars is; she doesnt know she is a brand. 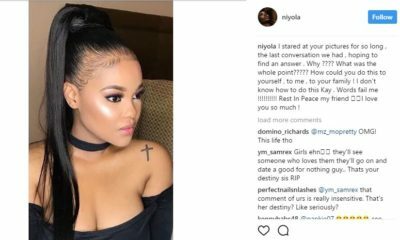 now this is it, thumbs up to Niyola for being so humble even in her response to a fan who wants her to cake up her face 24 hours with layers and layers of foundation and 24 inches of human hair just to make people believe she is a star. 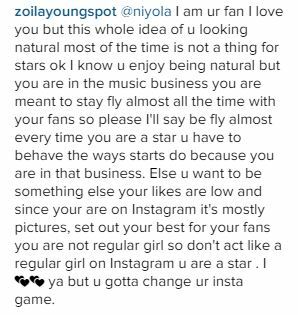 Niyola, keep being yourself, do not try to go up and above just to validate anything, just keep making good music . most of them celebs will cuss out this fan for pointing out to them to up their games a little. Niyola, put up a mature response. By the name alone, one can tell that it was either a child or a bubble head that wrote that nonsense to her in the first place. 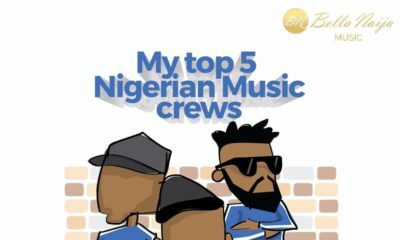 Niyola, your head dey there ojare, epatewo epatewo fun sisi Niyola……. I hope her Niyola’s business manager agrees with her. She got a feedback regarding the potential of her market penetration with a certain segment of her market, but she finds it hard to relate. I hope the Insta Game brings her money. I thought ‘show’business was about money. If you can’t show ” fly” I wonder how her business model would last. Thank you. I don’t think Niyola’s response was appropriate jare. It’s amazing how these celebs wanna-bes want us to mind out business yet they put their business on the GRAM where everyone is holding a Mic. Niyola is a basic non-factor anyways so if she like make she put her shuku and koroba on twitter claiming to keep it real. Celebs needs packaging to breakthrough into mainstream media. Niyola needs re-packaging IF and ONLY IF she wants to grow as an artist. If she wants to continue to me a non-factor then, stay true to your sweat pants and makeup free face. Cynhams Cakes, Abuja. (home delivery). That supposed concerned fan should have sent her a private message instead. That’s why instagram has the “DM” option. That’s how a “fan” told one lady she doesn’t know how to draw her eyebrows well. I love Niyola’s response though. The ‘fan’ couldn’t express herself properly. She actually wanted to say Niyola is forgettable. Continue to be “humane”, it’s great for your ‘brand’ sef. I’m tired of defending you Niyola. I’m tired. you and your perpetually caustic comments. jide this is a new year 2016, get rid of it girl! Nicole needs to commot from that stupid record label that EME record label…. “Humane”? What’s happening to education in Nigeria? My fren, pick up a darn dictionary! I really should not comment on this as I am a slummy mummy who goes out of the house in her pyjamas ?, but really if she is really serious about her career she needs to put glam pictures on Instagram. She is a celeb and this is part of her job. I don’t agree jor!!!! All this natural business is just because you don’t want to compete with other fly babes!! Simple and short! So you hide under the whole “I’m natural’ nonsense. We were all natural Hun! All of us, so it’s nothing special. Sorry. It’s just basic Asf. Step up your game! Show us why you should be on a stage!! Showcase your talent, beauty and personality to its greatest advantage. If you can’t pls give way for those who can. Humane kor, humane ni! Abegi! To those of you picking on her for using words like ‘while’ and ‘Humane’… Ever heard of typo? Its just common sense to see she meant ‘whole’ and ‘Human’. .. Shior!